Clearly Fungi Free fights nail fungus for topical application and for treatment of toes, fingers and surrounding tissue using an infection fighting antibacterial and anesthetic agent (Benzocaine) to reduce pain. Clearly Fungi Free spreads and penetrates quickly for maximum effectiveness leaving no oil residue. Clearly Fungi Free can be used before any nail application without affecting adhesion of nail products like glues, wraps, acrylics and gels. Clearly Fungi Free can also be applied after other nail products are already on the nail without loosening these products. Benzocain – amount in milliliters has not been provided in the vendor source description. No information about product dosage or application is provided in vendor product source information. The product comes in a 1 once bottle with an applicator and according to the vendor source can be used with any nail application. $11.00 for a 1 once bottle with an applicator. No information has been provided in the vendor source about vendor guarantees or refunds or money back policies. From the vendor source description the product appears to be versatile as well as compatible with existing nail applications but is not inexpensive at $11.00 for a 1 once container. Potential users may want to contact the vendor for more information about product application and about product guarantees and refunds. 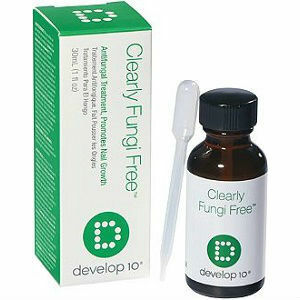 Jack Stevens	reviewed Develop 10 Clearly Fungi Free	on February 3rd	 and gave it a rating of 3.